A 6.8 magnitude earthquake struck off the coast of Indonesia's Sulawesi island Friday, prompting tsunami warnings that were later lifted. 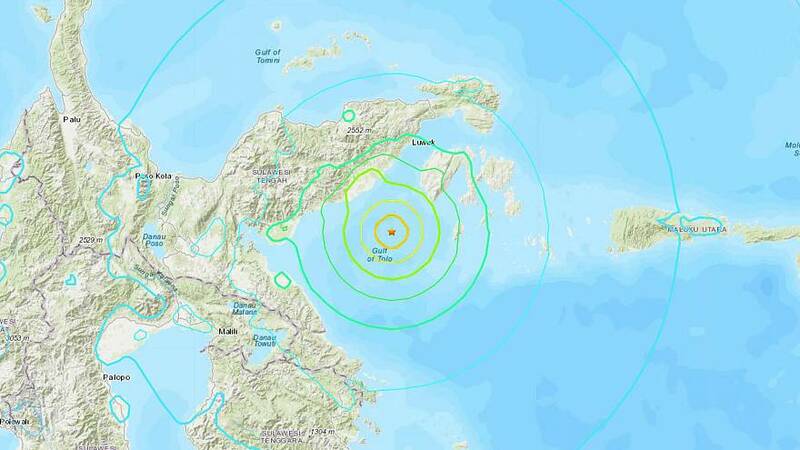 The strong quake was centered at a depth of 10.5 miles below the surface and hit near a cluster of islands off the east coast of Central Sulawesi, according to the United States Geological Survey. About 310,000 people were within a 62-mile radius of the earthquake's center, according to the Global Disaster and Alert Coordination System. Indonesia's Meteorology, Climatology, and Geophysical Agency warned of a possible tsunami after the quake, which struck at 6:40 p.m. local time, but said at about 8 p.m. that the threat was over. Earthquakes, tsunamis and volcanic eruptions are common in Indonesia due to its proximity to the seismically-active Pacific "Ring of Fire." A 7.5-magnitude quake that hit the opposite side of Sulawesi last year, triggering a tsunami, killed more than 4,000 people and devastated the city of Palu. Although the city is far from the epicenter of Friday's quake, people there felt it, and ran into the streets panicking, The Associated Press reported.